Subject: How Did George Soros Break the Bank of England? seven − = six Required Please enter the correct value. Billionaire George Soros has a lot of money. 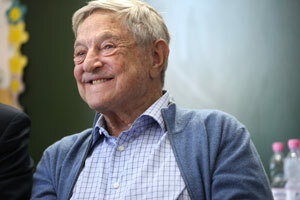 His 2014 earnings came in at $1.2 billion, landing Soros the No. 2 spot on Forbes' list of the highest-earning hedge fund managers and traders. Soros has done a lot to amass his fortune. But his most famous investment happened way back in 1992. That's when Soros "broke the bank of England" and made $1 billion in a single day. Exactly how did George Soros break the bank of England? He did it by shorting the pound. "To appreciate how Soros made a fortune betting against the British pound requires some knowledge of how exchange rates between countries work," said Rohin Dhar, CEO of Priceonomics, in a May 14 article, "and the macroeconomic tools governments use to stimulate economies, and how hedge funds make money." European nations decided to consolidate their economies after World War II. Tighter relations between countries meant lessening the likelihood of another war. In 1951, the Treaty of Paris brought together the "inner six" nations that made up the first European consolidation: France, Italy, Belgium, Netherlands, Luxembourg, and West Germany. The "European Union" would not officially assume its title until Nov. 1, 1993. It would appoint a single currency, the euro, on Jan. 1, 1999. The euro was originally meant to be used as a singular, interchangeable form of currency between countries, while each country continued to use its own exchange. But Soros broke the Bank of England seven years prior to the euro's birth. Over the years, these "inner six" added Denmark, Greece, Ireland, Portugal, and Spain to form the European Economic Community (ECC), and in 1973, the United Kingdom joined. The ECC countries wanted to interchange currency between European nations, but at the same time, they weren't entirely ready to give up their own individual currencies. So they implemented the European Exchange Rate Mechanism (ERM) in 1979 to strike this balance. With the ERM, ECC countries agreed to fixed exchange rates (exchange rates determined by the government in which a set price is determined against a major world currency) in lieu of floated exchange rates (exchange rates determined by the private market, through supply and demand). Germany had the strongest economy in Europe at the time, so each country set their currency's value in deutschmarks. While the U.K. was a member of the ECC, it forewent the ERM, instead opting to keep a floated exchange rate. How George Soros Broke the Bank of England: Enter the U.K.
From January 1988 to October 1990, inflation in the U.K. rose from 3% to 10.9%. In a move to combat the extreme rise, England entered its currency — the pound sterling — into the ERM on Oct. 5, 1990. "By hitching the pound to the deutschmark, it hoped to get a German-style economy, with stability and low inflation," the BBC explained in a 2005 article. But entering the ERM didn't have Britain's intended effect. "Although the move did give us low inflation, it did not provide a stable economy," the BBC wrote. You see, by 1992, Germany was suffering economically after the reunification of the East and the West. In response, it increased its prime rate – which meant other ERM countries had to do the same. The move hit England especially hard. "The British Pound in particular was consequently heavily overvalued at the time," German news outlet Deutsche Welle stated. "In addition, the U.S. dollar was losing value, and so Europe, and above all Britain, was under pressure." According to The Guardian, "The Italian lira and Spanish peseta were also under pressure, but it was the pound that was grabbing the headlines." Shorting (short-selling, going short) a stock offers the simplest and purest way to profit from a downturn in an individual stock or the overall market. It's a powerful short-term strategy – but it should only be used when you have a compelling reason to believe an investment is headed toward failure. Each participating ERM country is required to keep their exchange rate balanced somewhere between "bands" (limits) designated specifically for each currency and whether its currency is floated or pegged. A country's exchange rate should not rise over the ceiling band, or fall below the bottom band. Failure to keep its rates between the target limits results in a country's forced withdrawal from the ERM. In the early 1990s, the U.S. dollar fell gradually due to a stagnant economy. This hurt the U.K. in particular because it relied heavily on exports priced in dollars. Sterling likewise depreciated. Then in 1992, Germany's prime rate increased. Several countries scrambled to keep their currencies within their designated exchange rate limits. But the U.K. struggled the hardest. On Sept. 15, 1992, Soros began selling off pounds in massive amounts. This was Soros' power play that resulted in a massive devaluation of sterling. The U.K.'s exchange rate was on the verge of falling below the ERM's designated lower band. At market open on the next day, Sept. 16, 1992 (Britain's "Black Wednesday"), the Bank of England began purchasing large amounts of pounds sterling to prop its currency back up. But that failed to work. At 11 a.m., the Bank raised interest rates from 10% to 12% in hopes of luring investors into buying pounds sterling. This didn't work either. At 2 p.m., the Bank raised its rates to 15%. But, as The Guardian so eloquently put it on Sept. 16, 2002 (the 10th year anniversary of Black Wednesday), "the sell-off continued." The price of the pound dropped by more than 9.5% that day, falling from a valuation equivalent to 2.80 deutschmarks down to around 2.55 deutschmarks. Soros' day-long duel with the Bank of England earned him $1 billion. According to The Guardian, at 7:40 p.m., "[Chancellor Norman] Lamont appear[ed] outside the Treasury to announce the suspension of Britain's membership of the Exchange Rate Mechanism, and rescind[ed] the second increase in borrowing costs. Rates returned to 10% the next day." George Soros had won. He profited a whopping $1 billion in a single day, at Britain's expense. Follow Money Morning on Twitter @moneymorning. "We can't be beggars sitting on a sack of gold." This was socialist Ecuadorian President Rafael Correa's favorite catchphrase during his reelection campaign that ended in a sweeping victory on Feb. 17, 2013. Correa's "sack of gold" referred to the Cordillera del Condor, a rainforest mountain range laden with precious metals – especially gold and copper, but also silver and platinum. But the President has since let China ruin its sacred tribal lands to add more to their mysteriously large yellow metal stockpile…. Priceonomics: "The Trade of the Century: When George Soros Broke the British Pound"
The Guardian: "Black Wednesday 20 Years On: How the Day Unfolded"
de: "20 Years of 'Black Wednesday': How George Soros Toppled the Bank of England"
BBC: "Q&A: The ERM and Black Wednesday"
Your story is just that & without credibility. The Prime Minister appointed a senior banker (from Warburg) to set up the mechanism to devalue the Pound. The Banker undertook this task together with a single assistant under the strictest secrecy. It is merely speculation that Soros picked up a whisper (perhaps from an electronic bugging device) that provided information regarding the timing of the devaluation. But, it is difficult to make profit by short selling when market is volatile and company operators keep changing stock prices to their benefit. Even Stock Exchange Regulators do the same thing as volumes are shown with heavy manipulation. Sometimes nifty goes up and down without any valid reasons. However, when there is mass scale downfall in stock market due to global reasons or due to countries own failures this is time with big opportunity for investors to earn a lot in a single day by short selling. Such opportunities come once in a quarter may be.